Masonry Wash soaks into and softens soot, traffic film, algae, moss and general grime on stone, brickwork, concrete footpaths, etc. This allows quick, easy removal from the substrate, without causing corrosion. 1. Spray area to be cleaned. Ensure generous coverage, to soak the surface. 2. Wait for a few minutes to allow Masonry Wash to penetrate. 3. Scrub area to remove grime, soot, etc. 4. Rinse well with clean cold water. 6. Wash hands after use. 1 litre covers up to 8 square metres. 5 litres covers up to 40 square meters. 25 litres covers up to 200 square metres. Protect eyes when working overhead or outdoors if windy. Wear impervious gloves for prolonged use. 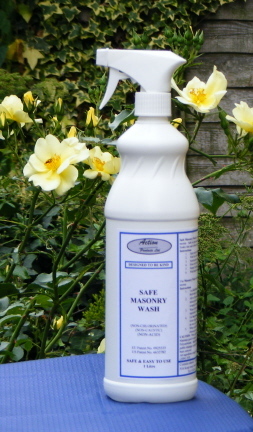 Masonry Wash ingredients comply with the European Commission's "Green Public Procurement" guidelines for local authorities, as published in "Guidance for Responsible Public Procurement of Cleaning Products" and by themselves do not constitute a hazard. However, necessary measures may have to be taken to deal appropriately with material(s) washed off the substrate.